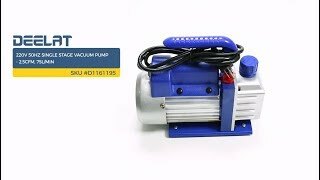 An important component in HVAC and similar systems, this vacuum pump is an effective and reliable solution. The pump features a lightweight and durable construction with a weight of 7kg. It is a single stage pump with a 2.5CFM capacity. The integrated inlet port is 1/4" SAE and the pump operates on 220v or 50Hz with minimal noise and vibration. The handle has been ergonomically designed for user comfort. The maximum vacuum created by this pump is 37.5 microns.